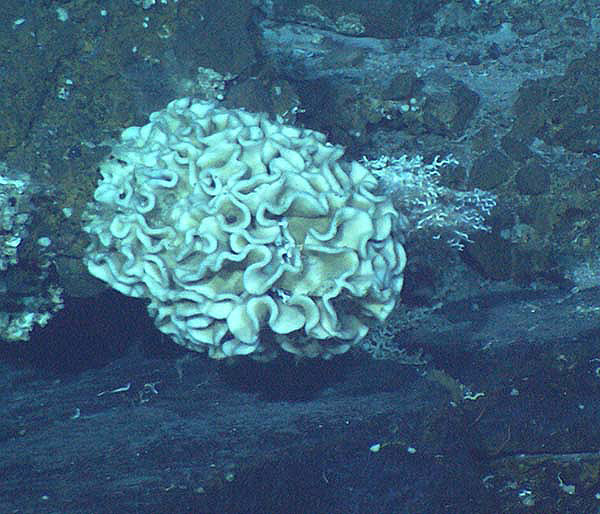 The image may be one of a large 20-cm wide Xenophyophore. Xenophyophores are single cell animals called Protists. As benthic particulate feeders, xenophyophores normally sift through the sediments on the sea floor. and excrete a slimy substance; in locations with a dense population of xenophyophores, such as at the bottoms of oceanic trenches, this slime may cover large areas. Local population densities may be as high as 2,000 individuals per 100 square meters. Image courtesy of IFE, URI-JAO, Lost City science party, and NOAA.